Constitutional commissions chair take oath - Integration Through Media ....! 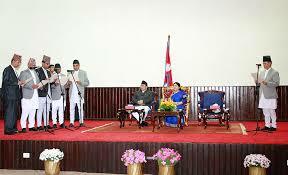 KATHMANDU: Newly appointed chairpersons of the five constitutional commissions took oath of office and secrecy today. In the presence of President Bidya Devi Bhandari, Chief Justice Cholendra Shumber JB Rana administered the oath of office and secrecy to them at a function held at the Office of the President, Sheetal Niwas. Those taking oath were Chair of National Natural Resources and Fiscal Commission Balananda Poudel, Chair of National Inclusion Commission Dr Shanta Raj Subedi, Chair of Madhesi Commission Dr Bijaya Kumar Dutta, Chair of Tharu Commission Bishnu Prasad Chaudhary and Chair of Muslim Commission Samim Miyan Ansari, according to the President’s press advisor Madhav Sharma.